The Priest class arguably got the most significant power boost with Naxx. Previously considered to be the weakest class, it's now far more common and far more viable. Part of the reason for that is the downfall of the Combo/Burst metagame that ill-favored Priests, which has been replaced by a greater emphasis on board control. Priest has always been a class that struggled to secure the board, but becomes nigh unstoppable if it does. Now, thanks to cards like Deathlord and Dark Cultist, the Priest is able to assert board dominance very early in the match, and then create a snowball effect based on card advantage, efficient removal spells, and using the healing hero power to keep creatures intact. Sjow's deck uses two 5-mana Legendary 'Hate' cards in Harrison and Loatheb to help lock the board down. Loatheb is an obvious inclusion, increasing the win-rate against Druids using the Force of Nature-Savage Roar combo and Miracle Rogues, while Harrison Jones is particularly useful against the new Control Warrior decks running double Death's Bite. The most interesting aspect of post-Naxx Priest is how individually strong the cards are. Sjow's deck eschews combos based on Circle of Healing, which used to be the backbone of the deck, in favor of strong standalone cards to create a very powerful mid-range build. Play it because… It's one of the purer board control builds out there. If vying for the board is something that you enjoy, but you don't want to play something as aggressive as Zoo, this minion-heavy Priest is unlikely to leave you disappointed. StrifeCro shows us once again why he is considered the Druid grand master, with yet another build for his favorite class. Druid hasn't changed much since Naxx was released, but it was already one of the strongest classes in the game. The main changes here are to the 5-mana slot and early game. Spectral Knight is an excellent target to ramp out early using Innervate. The fact that it can't be targeted directly with spells often leads to inefficient minion or weapon trades from your opponent. Aside from that we see the 2-drop token makers in Echoing Ooze and Haunted Creeper. Interestingly, it also includes a Shade of Naxxramas, another card that when ramped out can certainly change the dynamic of the game. StrifeCro's Cloud9 teammate Kolento piloted this deck to #1 on the ladder last season, but I suspect it will undergo further revisions. It runs double Echoing Ooze, but the only buffs are Savage Roar and Defender of Argus. I could potentially see a Power of the Wild snuck in here to make better use of the Oozes' devastating value. The Shade can function as a large threat after a couple of turns, but I think it's best used as a cheaper yet potentially larger Stranglethorn Tiger in conjunction with the Force of Nature-Savage Roar combo. Adding another stealthed damage to the 14 points from hand that the combo delivers makes it very hard to stay outside of a Druid's burst range. Play it because… Mixing elements of control, combo and token gives this deck a really interesting feel. It's fun to be able quickly ramp a lot of minions out and then do devastating bursts of damage. Well, what can I say, it's finally happened. Secret-based Mage decks have been around forever, but were too inconsistent to be much more than a gimmick. Until now. Naxx has given us one card that has made all Secret decks much more viable. That card is, of course, the Mad Scientist. He's more than good, he's downright broken—especially for Mages, who pay pay 2 mana for a 2/2 body and a 3-mana cost secret which doesn't even need to be in your hand. It's pretty absurd when you think about it. The finisher of choice in this deck is the Feugen-Stalagg combo, though I'm not sure how I feel about them. 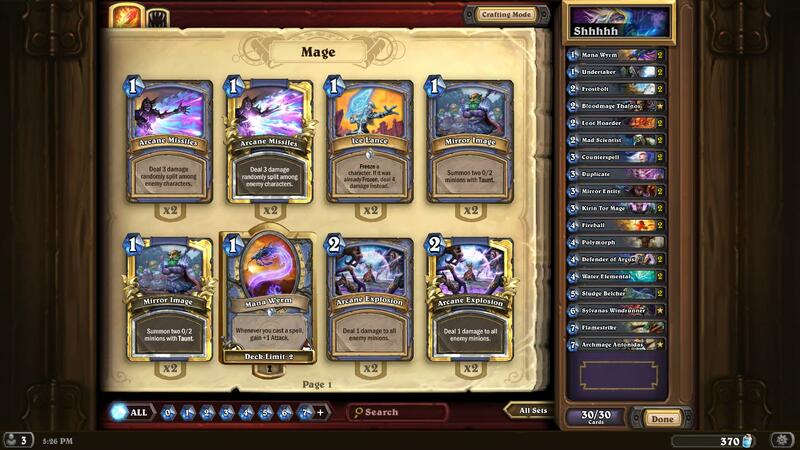 (It might be worth checking out this build , which uses Archmage Antonidas as an alternate win condition.) Although really, it arguably doesn't need a finisher. The card synergy and board presence is so strong that (aside from Hunter), it's only likely to lose to burst combos, for which it has Loatheb backed by Duplicate to potentially stall out the game for up to 3 turns. Much like the Priest deck and Druid, this is quite midrange in construction, which is a general trend of post-Naxx decks. Play it because… You like screwing with your opponent's head with a myriad of secrets and buffing Undertakers and Arcanists into unstoppable monstrosities. Next page: Warlock, Rogue & Shaman.